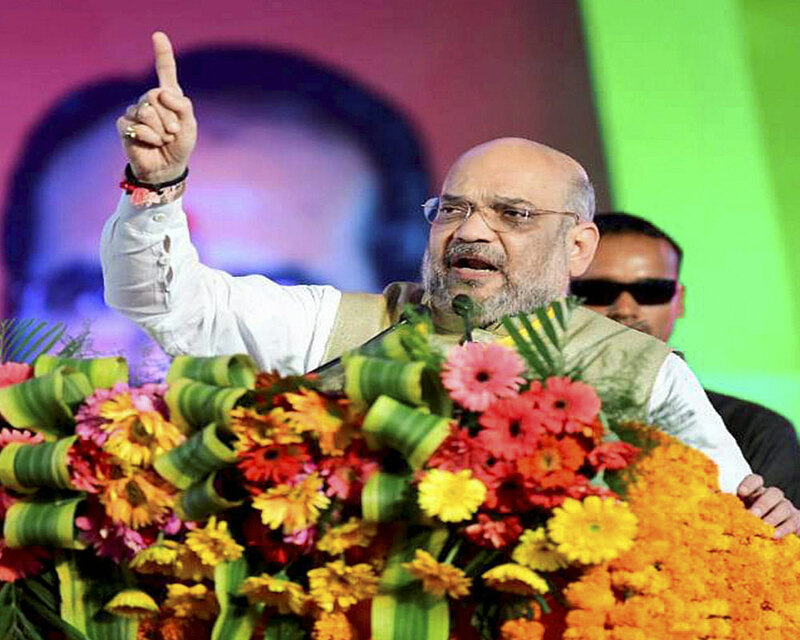 A week ago, in an informal chat with journalists about the party’s prospects in the bypolls, BJP president Amit Shah had predicted that the BJP will win in Palghar but may face tough contest in Kairana. Shah had rightly sensed that after four years in power, the BJP’s fortune now depended on the index of Opposition unity. The bypoll results of 10 States covering four Lok Sabha seats and 10 Assembly seats show that the tide is turning against the BJP. The LS bypoll results were equally divided between the BJP-led alliance (two) and the Opposition parties (also two), but the outcome of the 10 Assembly bypolls came as a big setback for the ruling party which could win just one seat in Uttarakhand. The Congress bagged three (in Meghalaya, Karnataka and Punjab) and others got six —JMM 2 in Jharkhand; CPI (M), SP, RJD and Trinamool 1 each in Kerala, UP, Bihar and West Bengal, respectively. The Congress also won one Assembly seat in Maharashtra without contest after all other parties withdrew their candidates. The results sent another interesting message that like Uttar Pradesh, the BJP could face serious trouble in Maharashtra if the Opposition, including the Shiv Sena, was able to ensure a one-and-one contest. This was clear in Bhandara-Gondiya, where NCP’s Madhukar Kukade defeated Hemant Patle of the BJP by 48,097 votes. At Palghar, BJP’s Rajendra Gavit won the seat defeating Shiv Sena’s Shrinivas Wanaga. The BJP may rejoice its Palghar victory, but the Sena came a close second and ensured that the saffron party’s victory margin came down from 2,00,300 to a mere 29,572 votes. The Bahujan Vikas Aghadi (BVA), which had won this seat in the 2009 Lok Sabha elections but lost it to the BJP in 2014, also polled close to 2 lakh votes, while the Congress came a distant fourth with 40,000 votes. It’s clear like in Gondiya, where the Sena didn’t put up its candidate. If the NCP and the Congress were united, and there was no BVA in the race, the verdict could have been entirely different. After the BJP lost Gorakhpur and Phulpur bypolls to the BSP-SP combine, the BJP put all its might to win Kairana. A victory here could have been a psychological booster for the party which is yet to recover from losing at the home turfs of the UP Chief Minister and the Deputy Chief Minister only two months ago. The poll-eve roadshow held by Prime Minister Narendra Modi in Delhi and his public meeting in Baghpat was a clear attempt to send message to the voters in Kairana. The BJP had also fielded many of its stalwarts to regain the seat which its late MP Hukum Singh had won by over 2.5 lakh votes four years ago. On the other hand, both SP chief Akhilesh Yadav and BSP supremo Mayawati did not even campaign in Kairana. However, both these leaders were able to transfer their vote bank to the RLD candidate, Tabassum Hasan. This is something which the BJP should worry about. The BSP and the SP have been bitter rivals for ages. If their vote banks could come together so spontaneously, UP would become a very dangerous terrain for the BJP in 2019. While Tabassum Hasan won the Kairana seat by a margin of 44,618 votes, Naeemul Hasan of the Samajwadi Party bagged the Noorpur Assembly seat by a margin on 5,662 votes. Both seats were earlier held by the BJP. in Kairana. Tabassum polled 4,81,182 votes, while the BJP’s Mriganka Singh got 4,36,564 votes, the election office here said. Hasan (48) has now become the first Muslim face from Uttar Pradesh in the 16th Lok Sabha. Kairana’s loss also shows that the BJP cannot hold against the united Opposition across the State, be it Gorakhpur in eastern UP, Phulpur in Central UP, and Kairana in Western UP. The Kairana verdict also shows that UP was ready to leave behind the communal hatred triggered by 2013 Muzaffarnagar riots and attempts at polarisation may not work so effectively any more. The outcome of Jharkhand also showed that the BJP stood no chance against a united Opposition. The JMM, which was supported by the Congress and other Opposition parties, retained both Silli and Gomia Assembly seats in the by-election. The bypoll has also come as a rude shock to Bihar Chief Minister Nitish Kumar. The JD(U) suffered crushing defeat in the Muslim-dominated Jokihat Assembly bypoll. The ruling party, which had been winning this seat for 13 years, lost it to the RJD whose Shahnawaz Alam defeated JD(U)’s Murshid Alam by a margin of 41,124 votes. The top leaders of the JD(U) including party chief and Chief Minister Nitish Kumar had campaigned and senior leaders of his party including Ministers had camped in the Muslim-dominated constituency in a bid to retain it. The result shows that Muslims have abandoned Nitish Kumar after he joined hands with the BJP. The outcome showed that the way CBI and other agencies have gone against Lalu Prasad and his family is generating strong sense of sympathy towards the RJD. As expected In West Bengal, the ruling Trinamool Congress registered an impressive victory in the Maheshtala Assembly bypoll defeating its nearest rival BJP by a margin of 62,765 votes. TMC candidate Dulal Das secured 1,04,818 votes as against 42,053 votes bagged by the BJP’s Sujit Ghosh, a senior EC official said. Left Front’s Prabhat Chowdhury was third with 30,384 votes. The BJP had the consolation of retaining the Tharali Assembly seat in Uttarakhand by a slim margin. Its candidate Munni Devi Shah defeated Congress nominee Jeetram by 1,981 votes. The Congress retained the RR Nagar Assembly seat in Karnataka by a huge margin in a triangular contest. The election here was counteredmanded after recovery of thousands of fake voter identity cards. In Punjab, Congress’ Hardev Singh Ladi wrested Shahkot from the Shiromani Akali Dal. Chief Minister Amarinder Singh hailed the victory as a “vindication” of the Government’s people-centric policies. In Kerala, the CPI(M)-led LDF retained the Chengannur seat by a huge margin. LDF’s CPI(M) candidate Saji Cherian defeated his UDF rival, D Vijayakumar of the Congress, by a margin of 20,956 votes while the NDA suffered a big setback as BJP candidate PS Sreedharan Pillai came a distant third. Six months ago, the BJP looked invincible under the Modi-Shah combine. But the coming together of Mayawati and Akhilesh proved a game-changer for the Opposition. Karnataka took the Opposition unity a notch further. If the Opposition was able to put up a united face, by all indication, the country will witness thriller of a general election next year. TDP cuts ties with NDA, to move its own no-confidence motion against Modi govt. The Telugu Desam Party (TDP) on Friday decided to pull out of the BJP-led National Democratic Alliance (NDA). The decision was announced by TDP president and Andhra Pradesh Chief Minister N. Chandrababu Naidu during a teleconference with party polit bureau members in Amaravati in the morning. The polit bureau also took a decision to move its own no-confidence motion against the Union government in the Lok Sabha instead of supporting the one to be moved by rival YSR Congress Party (YSRCP). A polit bureau member told the media that it was an unanimous decision. The formal announcement of leaving the NDA was done hurriedly to facilitate party MPs to move this motion, for denying Special Category Status and for not implementing the provisions of the Andhra Pradesh Reorganization Act. Apparently, the party changed its decision overnight to deny YSRCP taking the credit for moving a no-trust motion. The party also suspects that the BJP was conspiring with YSRCP and Jana Sena Party of actor Pawan Kalyan to weaken the TDP. Sixteen TDP MPs would now submit a notice on moving a no-confidence motion to the Lok Sabha Secretary General. Chief Minister N. Chandrababu Naidu is believed to have told the polit bureau members that he would write a letter to BJP president Amit Shah, explaining why the party is leaving the NDA and the developments in the last four years when the Union government’s support to the State was not to the level expected by Telangana people. He would also inform other NDA partners the circumstances that forced the TDP to come out of the NDA. Former State Minister Mayaben Kodnani was in the Gujarat Assembly at the time of Naroda Gaam riots, BJP president Amit Shah on Monday told a special designated court, which is conducting trial in one of the 2002 Gujarat riots cases. Mr. Shah, appearing before the court as a defence witness, said: “Mayaben was not present in Naroda Gaam as she was present in the assembly at 8:30am.” His deposition before the court is under way. The trial court judge PB Desai issued summon to Mr Shah at his residence in Ahmedabad, asking him to appear before the court on September 18. However, the court had said the summons will not be reissued if Mr Shah does not depose on the due date as per the court’s instruction. Dr Kodnani had sought examination of 14 people, including Mr. Shah, to prove her alibi that on February 28, 2002, the day riots broke out in Naroda Gaam, a locality in North Ahmedabad, she was not at the scene of the crime as is being accused by the Special Investigation Team (SIT) which is prosecuting agency in the case. Earlier, the court conducting trial in the Naroda Gaam massacre had summoned BJP President Amit Shah to depose before the court as defence witness on September 18. The trial court judge PB Desai issued summon to Mr Shah at his residence in Ahmedabad, asking him to appear before the court on September 18. However, the court had said the summons will not be reissued if Mr Shah does not depose on the due date as per the court’s instruction. Dr Kodnani had sought examination of 14 people, including Mr. Shah, to prove her alibi that on February 28, 2002, the day riots broke out in Naroda Gaam, a locality in North Ahmedabad, she was not at the scene of the crime as is being accused by the Special Investigation Team (SIT) which is prosecuting agency in the case. Among those 14 persons she listed as witnesses, 12 including her husband have already testified in her favour and endorsed her contention that she was not present when the offence happened. Mr Shah is the last listed defence witness in her trial; all others have been cross-examined by the court. Prime Minister Narendra Modi and BJP president Amit Shah were among the top BJP leaders who attended the swearing-in ceremony. Governor KK Paul administered the oath. The BJP won 57 seats in the 70-member Assembly. Satpal Maharaj, Harak Singh Rawat, Madan Kaushik, Arvind Pandey, Subodh Uniyal, Yashpal Arya and Prakash Pant were also sworn in. They will be made state Cabinet ministers, PTI reported. Rawat defeated the Congress’s Hira Singh Bisht in the Doiwala constituency with a margin of over 24,000 votes. This was his third win from the constituency since 2002. “My own belief is that people in the state want opportunities that will help them grow. Therefore, our focus is going to be on development of the hills as well as the plains by providing suitable opportunities for people,” Rawat told TOI yesterday. Rawat has considerable administrative experience+ as he was a minister in the BJP governments led by B C Khanduri and Ramesh Pokhriyal Nishank. The 57-year-old will be the fifth BJP chief minister in Uttarakhand. The party formed its first government in the state when it was carved out of Uttar Pradesh in 2000, with Nityanand Swami as the first Chief Minister. Swami was replaced by BJP’s B.S. Koshyari in March 2001. Rawat, a Thakur leader, was among the frontrunners for the Uttarakhand chief minister‘s post, in part due to his strong RSS roots. He was an RSS pracharak from 1983 to 2002+ and held several important positions in the Sangh. Besides Rawat, Satpal Maharaj and Prakash Pant were in the race for the post. The former Uttarakhand BJP chief is also known to be close to BJP president Shah and the party’s central leadership, which likely strengthened his chances at heading the state’s executive. During the 2014 Lok Sabha elections, Rawat was given responsibility of regional election in-charge in Uttar Pradesh under Shah. Rawat joined the RSS when he was 19 and has been fiercely loyal to it and the BJP. Hitting back at Congress president Sonia Gandhi, BJP president Amit Shah asked her on Thursday to clarify who were the beneficiaries of the VVIP chopper scam. “It has been established by an Italian court that kickbacks were given. Rather than saying she is not afraid of anyone, she (Sonia) should clarify who received the kickbacks,” Shah told reporters. Gandhi had on Wednesday said she was not afraid of the bribery allegations made against her. He said the Congress was a unique party whose corruption deals were coming out even two years after it was ousted from power. Shah’s remarks came after Prime Minister Narendra Modi chaired a meeting with senior ministers over the scam. The meeting was attended by Home Minister Rajnath Singh, Finance Minister Arun Jaitley, Parliamentary Affairs Minister M. Venkaiah Naidu and his junior Mukhtar Abbas Naqvi. A combative Congress on Wednesday dismissed the bribery charges in the VVIP chopper scam. The Congress in turn accused the Narendra Modi government of trying to help the Italian firm which had been blacklisted. A Milan court sent Finmeccanica’s former CEO Giuseppe Orsi and AgustaWestland ex-head Bruno Spagnolini to jail for false accounting and corruption in the sale of 12 VVIP choppers to India. The court ruling refers to Manmohan Singh, Sonia Gandhi, her secretary Ahmad Patel and also former Indian Air Force chief S.P. Tyagi. BJP President Amit Shah today claimed that his party will form the next government in Uttar Pradesh after assembly election in the state due next year. “I am confident that the party will form a majority government after 2017 election,” he told reporters after inaugurating the party’s newly renovated state office. Shah said that he didn’t want to talk about politics, but he wanted to refer to nationalism. “I want to ask Congress and specially its Vice President Rahul Gandhi that whether he consider slogans raised in JNU as anti-national or freedom of speech,” he said. He must clarify about his party’s ideological ground, he said. The BJP President said that he had been raising the question for the last six days, but Rahul was maintaining silence. He asked the party workers to raise the issue in every village and said that such slogans would not be supported in democracy. Shah said that strict action should be taken against those involved in such activities. Attacking Rahul, Shah had alleged yesterday in Bahraich, that he was supporting the forces dividing the country for “votebank politics”. “I specially want to ask Congress and its workers whether those raising slogans like ‘Afzal Guru tere hatrayre zinda hain’ and ‘Bharat ke tukde honge’ were traitors or not,” Shah had said at a public meeting after unveiling of a statue of 11th century king of Shravasti, Raja Suheldeo. Rahul has come out in support of JNU students, who are protesting the arrest of JNU Students’ Union leader Kanhaiya Kumar on sedition charge, and has accused RSS and BJP of imposing their ideology.